Bovis Homes South West region were proud to play their part in recognising the amazing achievements of an inspirational Cornish lady. Jacqueline Heather was a worthy winner of the 'Inspiration to Others' category when radio station Pirate FM held their Local Heroes awards at Tregenna Castle in St Ives. Bovis Homes sponsored the award which was handed over to Jacqueline by Regional Sales Manager David Duignan. Jacqueline, from St Austell, is a volunteer for the local Expert Patient Programme, which helps people learn to cope with long-term illness. This is an even more impressive feat, when you consider that Jacqueline is in constant pain herself. Jacqueline was nominated by her boss Elaine, who said: "People have no idea what Jacqueline goes through on a daily basis to get to those training sessions and always gives 100% to the groups of participants. "She is waiting for a double transplant and this will be a risky procedure as she already had triple heart bypass surgery when she was younger. "She has since gone into stage 5 renal failure, and has a rare condition of the bones in her feet where they fracture continuously. She is type 1 diabetic and has poor eye sight. Even with all this going on in her life, she will take two trains to deliver a course and that to me is sheer dedication of Jacqueline's part. "Everybody on our courses gain so much from her ability to be gentle, caring and has huge amounts of empathy and compassion. She always puts aside her own pain, fatigue and feeling very unwell to go out there and make massive differences to other people who struggle daily to live with their own diagnoses." "I accept this award not just for myself, but on behalf of the other expert trainers at the programme and all the renal and cardiac teams that I work with as well, as they are incredible. I'd like to thank Bovis Homes for their hospitality on the evening and for sponsoring my award." 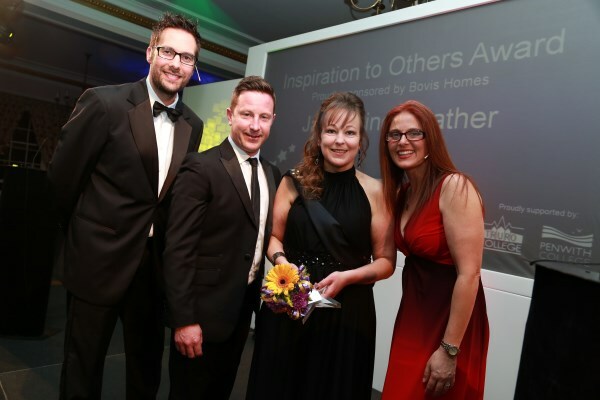 Bovis Homes Regional Marketing Manager Kate Brewer said: "It was an absolute honour to spend the evening with Jacqueline and her family and to learn about her life and the incredible work she does. "The awards ceremony is a really humbling and quite emotional experience, and the winners really are unsung heroes. Jacqueline is a true inspiration and her passion for what she does shines through."